Bird Id - Forum - Identifying Birds - Is This A Plover? What Type? Forum > Identifying Birds > Is This A Plover? What Type? I've been seeing huge flocks of these at Strangford Lough in the Winter for years, but never gotten close enough to ID them. This is the best photo I've managed to date, but was hoping someone here would be able to help. I've been googling images, but I can't find anything that has those eye markings. 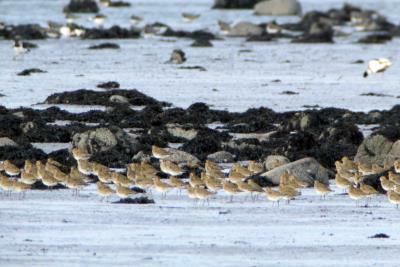 I was reckoning on a plover of some sort: they are about 1/2 - 2/3 the size of a Redshank. Hopefully someone can lend some clarity, or I'm going to just have to keep trying to get closer! Realised once the photo was up it wasn't going to show the eye, and can't post a photo in this reply, nor delete this post, so revision posted with a closeup!